This is the fifth part in my series on the system behind playing the blues on the guitar. In this part, I’ll talk about the role that the major pentatonic and major blues scales play when soloing over a blues progression. I’ll be referencing parts 1 and 2 a lot in this article. If you’re unfamiliar with what those articles talked about, go ahead and read them first. Part 2 covered the blues scale, which is a scale that’s formed by the minor pentatonic scale along with the blues note. 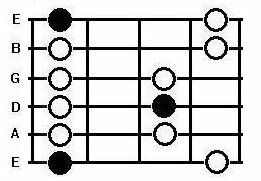 Usually, when people refer generically to ‘the blues scale,’ they’re referring to this minor pentatonic based scale. Now that we will be talking about two different types of the blues scale, I’m going to refer to that scale as the minor blues scale, since it’s formed from the minor pentatonic scale. Meanwhile, the scale that I will be writing mainly about in this article will be referred to as the major blues scale, because it’s formed from the major pentatonic scale. 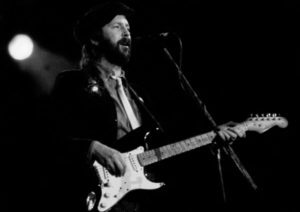 So, we now have two different types of blues scales: the major blues scale (covered in this article), and the minor blues scale (covered in part 2). The black circles in the pattern are the root note. 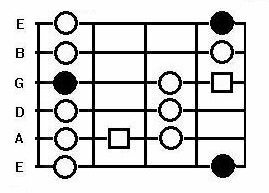 The white circles are the other notes in the minor pentatonic scale. You can see that his is exactly the same pattern of notes, but the black/root notes are in a different place. I don’t want to delve too much into the theory behind this right now, but if you’re curious you could read up on relative major and minor scales. 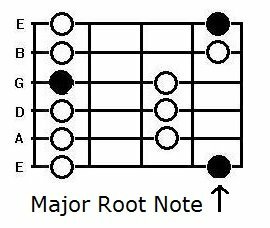 To make this into the major blues scale, we just have to think of a different note as being the root note, just like with the major pentatonic scale. The blues notes will be unaffected by this. That’s all you would need to do to go from using the minor blues scale to the major blues scale. You can use the major blues scale when soloing over any part of a blues progression. So, if you are playing a blues progression in the key of E, you could use the E major blues scale. If you are playing over a blues progression in G, you could use the G major blues scale, and so on. That means that you have two scale choices for any key in which you are playing. What I mean by that is if you are playing over a blues progression in E, you could use the E minor blues scale or the E major blues scale. If you are playing over a blues progression in G, you could use the G major blues scale or the G minor blues scale. You could also change back and forth between major and minor blues scales as you are soloing. So, you could do a few licks using the major blues scale, then switch and do a few licks using the minor blues scale, and so on. I find that the minor blues scale works pretty well over any chord in the blues progression. 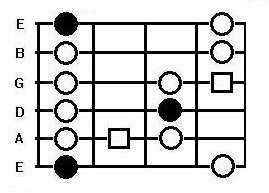 The major blues scale, on the other hand, works better over some chords than others. The major blues scale sounds great when used over the I chord. It sounds OK over the V chord, and can possibly sound not so great over the IV chord (if you’re confused about what I mean by these roman numerals, read through part 1 again). You just have to be careful with the IV chord. Lots of the notes in the major blues scale will sound fine over it, but there are a couple that will clash with the chord in an unappealing way. I personally prefer to use the minor blues scale over IV. Understanding these concepts and actually using them can be two different things. To help you get an even better idea of how the interplay between the major and minor blues scales can take place in a solo, I’m going to quickly follow up on this post with an ‘example’ solo, with an in depth article breaking down what’s happening in it. I had originally planned on including an example solo with this article. But, I then realized that to give it a good amount of explanation would push this article way too long. So, keep a look out for my next post, which will feature a video recording and tab of a blues solo using the major and minor blues scales. I’ll give a phrase by phrase break down of what is happening in the note choices I made, as well as talking about some other things like phrasing and building up tension within a solo. It should be up in a couple weeks. Posted in The Blues and tagged Blues, Improvisation, Intermediate, Scales, Theory.